If you feel your home is need of a fresh look, you’d be amazed at the difference a fresh coat of paint can make. In order to truly benefit from the investment of exterior painting, follow these three tips for superior results. Although you may be temped to jump right into a painting project, you need to be cautious when planning. Many exterior paint brands require a consistent and dry temperature around 50 degrees. If applied too early in the spring or late in the fall, you risk a poor-quality application because the weather can be wet and cold. The ideal months for exterior painting are late June through early September. Before any paint is applied, be sure the surfaces are well-cleaned and prepped. 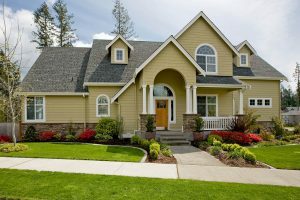 A quality contractor understands the surface needs for paint to properly adhere, and should take the time to sand, scrape and prime the exterior of the home before starting. With proper attention to the surface, a paint job should last between 8-15 years. Use caulk to fill in cracks or gaps between siding or boards. Painters tape can be used to protect edges and corners, as well as covering windows or areas where paint may splatter. For bushes or hedges, you may want to use drop cloths or plastic to prevent spills, drips or spray. The exterior of a home will come in many shapes, sizes, textures and materials. Carefully selecting the proper tools and paint type will bring longevity and ease to an exterior painting job. Discover the difference between latex, oil and acrylic paints, and understand what flat, gloss and semi-gloss may do to improve the shine of your home’s exterior. Rely on a contractor’s input for coverage through brush, spray or roller techniques. With attention to these tips, your painting project can turn your home into the best looking one on the block.